Updated: A friend corrected me that you don’t need a google voice number to forward calls straight to voicemail. I’ve updated my post accordingly. Recently I switched from an iPhone 3GS to an HTC Evo. This was mostly due to wanting to switch away from AT&T to cut costs, but the choice was also fueled by my desire to experience an Android phone. After having waited outside of a Sprint store for an hour and a half I was rewarded with an HTC Evo 4G. There are several people that I know that would appreciate a rundown on the differences between the devices and what to expect because they are thinking about what to get as well. I thought I would document my own experiences and relate the differences both good and bad between the iPhone and the Evo. 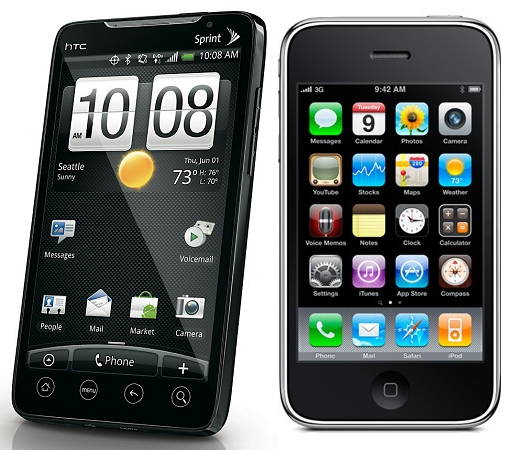 While this is in part a comparison between the physical devices of an iPhone 3GS 32GB and an HTC Evo, it also is a comparison between the iPhone OS 3.1.3 and Android 2.1. Obviously some things will change when the iPhone 4 comes out along with iOS 4. This is a pretty hefty list of my impressions so it might be a bit long to read. Stock images of an HTC Evo and iPhone. Note that they are not scaled to each other! The image above may be somewhat misleading as it is just a composite of the stock images of both phones and is therefor not to scale. The Evo is larger than the iPhone by a perceptible amount. If you thought the iPhone was too big, you won’t like the Evo. However if you want to see more of what you’re doing, the Evo’s increased screen surface area is quite welcome. The iPhone’s screen is 3.5″ diagonally while the Evo’s is 4.3″. The resolution is also quite higher on the Evo to go with its larger size being at 480×800 compared to the 3Gs’s 320×480. Obviously this will change with the iPhone 4. As far as the rest of the physical layout goes, the Evo has a kickstand on the back which is quite sturdy and pretty handy I think. I know I’ve tried to watch videos on the iPhone before and having to hold it in your hand is sort of a pain. There’s no real good way to prop it up. The Evo gets around that by having a built-in stand that lets it sit in landscape mode for watching vids on your desk (or floor as I did the other day). The iPhone comes with a small switch above the volume controls that lets you put it into silent mode with a quick flick. There is no such switch on the Evo and one has to turn it on and press the volume down button until it goes into vibrate mode. Similarly you have to press the volume up button to bring it out and back to your normal levels again. Annoying I think. You can download a widget to make silencing a simple button press which is handy, but uses up screen space and still requires you to unlock your phone and press something on the screen. The Evo sports 2 camers, a low res front facing one and a higher res rear facing one. Most of the time you’ll use the rear camera as it has higher quality, but if you want a quick pic of yourself or you want to do video chat the front camera is useful. The rear camera comes with an LED flash which can be handy in low light situations. The camera application for Android has way more controls including shutter speed, white balance, modes such as greyscale and sepia, and the ability to adjust the resolution. It can also zoom (though it looks like a digital zoom so the quality suffers, you might rather just crop after taking a regular photo), and record 720p video. 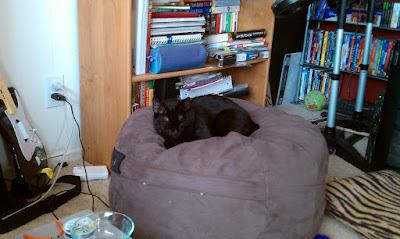 My cat Mischief on her plush throne. She was the unknowing model of one of my first Evo photos. There is an HDMI port to plug your phone up to a TV if you wanted to, but I don’t own a cable and I can’t really imagine myself doing that very often. Still it’s nice I suppose since it’s there. The other port on the bottom of the phone is a mini USB port for data transfer and charging. One of the things that I really like about having the Evo now is that I can use the same cables on my phone as my fiance’s Palm Pixi or my Kindle. Using a standard type of cable rather than a “dock” connector means we can have just one car charger and exchange cables around the house with whatever is available. Also, replacing the cable should be cheaper. Rather than just a home button, the Evo (and I assume most android phones), has 4 buttons on the bottom including a home button, menu, back, and search. This turns out to be nice in some ways, but less so in others. I find that applications for Android tend to rely on those buttons too much and as such apps are less intuitive on Android than iPhone since controls are hidden behind a menu or rely on a back button. The virtual keyboard on the Evo is pretty standard, though laid out differently than the iPhone. I do like that it comes with a button to hide the keyboard so you can see more of the app underneath. Also the keyboard is set up by default to give very small vibrations as you press the buttons as feedback to your tapping. As the clicking noise of the iPhone annoys me (so I turned it off), the vibration is a welcome change for knowing when you’ve pressed a button. It also works on the navigational buttons on the bottom. The keyboard itself does auto-correction like the iPhone does, but it seems less accurate on the word that I was looking for. I prefer, however, Android’s practice of showing you possible matches as you’re typing, letting you choose one of 4 possible matches. The built-in dictionary can be added to if you type in something that doesn’t appear on the list of matches, and I thought it odd that by default it was missing things like ‘voicemail’. Also if you type something in and want to make a correction, it’s more difficult to place your cursor on the Evo than it is on the iPhone. On the iPhone you can get a little magnifying glass showing your cursor position if you hold down the tap, the the Evo you just have to tap and hope it was close enough. If not, tap again. Holding the tap down just brings up a menu for selecting text and copying and pasting. In a way it’s nice that the battery is removable so that you can carry a spare, upgrade it, or replace it yourself. Unfortunately the battery doesn’t seem to last very long. It may be that my phone battery just wasn’t ‘seasoned’ yet, but a day from 9am to 11pm doing pretty much nothing but standby brought it down to 5% battery. Now this also could have been because I had applications running in the background that I didn’t know about, and there are apps out there to monitor and kill unwanted background applications. It’s a bit more of a hassle, but it might help my battery woes. Luckily one of the really neat features with an android phone is that the battery information screen will actually tell you what applications or services are using up the most battery. Under the battery is the micro SD card. By default you get an 8GB card. You can upgrade to a 32GB one, but I’ve not seen anyone sell anything larger than 16GB. You can swap out as many as you want to give yourself more storage, but its placement makes that impracticable. Also until Android 2.2 is out on the phone, you can only use the 440MB of internal memory for storing applications, unlike on the iPhone where it’s all one space that you can install apps and have data. However, the other side of that on the Android is that you can see the whole filesystem and actually save files directly on the Evo and transfer them later to your computer. This brings me to one of my biggest annoyances with the Evo, especially after having come from a set if iPhones: sync. Basically sync on an iPhone blows android out of the water. There’s no de-facto integrated package for syncing contacts, calendars, email accounts, photos, videos, and music on Android. There is an attempt to do some of those things with double-twist which is a sort of iTunes clone, but it fails in a lot of ways. Music syncing isn’t too bad, but videos need to be put into playlists for any type of control and photo syncing is basically broken. For photos it copies all of your photos into a single directory and skips ones whose names match. This means if you’re using a digital camera that labels photos with something like DSCF1293.jpg and you have 2 folders with different photos with the same name, you won’t get one of the photos. Also since it doesn’t sync folders you lose any organizational ability. I was surprised that Picasa doesn’t have any Android syncing, but it seems to not be important to Google. What’s also frustrating is that due to digital photography making larger and larger files it is hard to sync your entire library. I ended up using Picasa’s export feature to scale down photos in a separate directory that I would copy to the Evo. Picasa forces you to export one directory at a time so it can be a tedious process. The photo application that came with the Evo can link up to your flickr and facebook photo albums, but strangely enough not Picasaweb. I thought that was really odd considering Android is a google OS and the gallery application seems like it would be standard. Apparently there is another gallery application (some call it gallery3d) that can link to Picasa to view your web photos. If you don’t mind the minor delay and paying $5 a year for 20GB of photo storage (a good deal), then you can avoid copying photos to your phone all together and just use Picasa’s web photos. You’ll save space on your phone for music and video as well. Since the phone can run multiple applications, it needs to be able to tell you when something has happened with one of them. On the iPhone you would receive a notification popup that would block whatever you were doing in order to handle it. This can be really annoying if you’re in a game or even just browsing a web page. On Android, there is a very nice notification system that places notification icons at the top of the screen near the battery and cell status info. You can drag from the top of the screen down to expand the notifications and deal with them as you see fit. You can also clear them if you don’t wish to act on them. This is helpful for apps like Meebo which tell you your status or if you have a new IM at the top while not getting in the way of your current application. The app stores on both devices are fairly similar. They both divide apps up into categories and have tabs for top free and top paid applications along with a search. An interesting addition to the Android market though is the ability to install apps via a barcode scanner. You have to download a separate barcode scanner app first, but after that you can scan codes like the one below to launch the marketplace installer for that app. It’s good for when you see an app on your computer but you don’t want to type in the info or search box on your phone. Just scan and go. 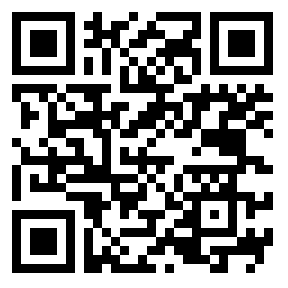 This is the QR code for Replica Island, an open source game for Android. When you want to uninstall an application, the iPhone has a much easier system of just tap-holding and clicking on an X. In Android you need to go to Settings -> Applications -> Manage Applications, click on the application, then click on uninstall. Interestingly enough you can also go to the Market app -> Downloads, click on the app, and do an uninstall from there. Either way it’s not quite as easy as on the iPhone. Applications can do more than just run in the foreground taking up the whole screen, they can also be (or supply) widgets that run on one of your home pages providing information or interaction on their own. There are many handy widgets such as Pandora’s radio controls, clocks, a calendar, quick contacts, a friend feed streamer, and probably a lot of other ones. The ability to get quick info without having to open a full app can save a bunch of time that you would be spending opening and closing custom apps for simple things. Unfortunately on the Evo you have to be careful of how many widgets you use as screen real estate isn’t as plentiful as on the iPhone. There are 7 screens to the home page instead of the iPhone’s 9, but it shouldn’t be too much of a problem. For all I know there might be an app to increase the number of screens. The android also has a nifty spaces-like display of all of your screens that you can access by hitting the home button while on the center home screen. Making phone calls is probably important for a phone as well, and the Evo does the job ok. It’s sprint rather than AT&T which can mean different things to different people in different places. For me it runs faster and more reliably, but I have good Spring coverage and AT&T wasn’t so good in my area. One thing to watch for though with the Evo on Sprint is that unlike the iPhone on AT&T, voice and data do not go together. This means if you’re using a data app like an IM client and you make or receive a call, you’ll get disconnected from your app (unless you’re on wireless). Not too big of a deal for me, but an interesting note. If you’re lucky enough to be in 4G coverage, this isn’t a concern as 4G works with both data and voice. I don’t have 4G yet though so I can’t comment on that. The Evo has multi-touch, but I don’t think the apps support it as well as on the iPhone. For instance, if I receive an HTML email there is no way for me to zoom in and out to various parts of it in the email apps that came with the phone. It’s possible that a 3rd party app would allow you to do so, but the default ones are lacking in that area. Other apps don’t always take into consideration orientation as much as apps on the iPhone seem to, but that could just be my luck with applications so far. The iPhone brought out visual voicemail which was amazing at the time. The Evo has this as well by default, but even better is the ability to get a Google Voice account which acts like visual voicemail on crack. You not only get to see the message in an inbox like setting, but Google with transcribe the messages as well. You can set custom greetings on a group or person basis so that certain people get certain messages. You can also set up special rules such as certain numbers going straight to voicemail or dropped completely. My Evo came with an application from Sprint that seems actually quite useful (not the NASCAR one), it’s called Sprint Navigation. It’s basically a turn-by-turn GPS direction program but it’s better than my current GPS in my car in that it will use traffic data to reroute you to get to your destination faster. While my GPS can also do this, it has a subscription fee. No fee on the Evo though so that’s a gain. So that’s what I can think of and have experienced for now. I used to have an iPhone and this new one is definitely different, and not bad at all. All things being the same I’m not really sure which phone I would choose. I do know that for me, developing apps on Android will be a lot easier than iPhone, but that’s not a normal concern. Hopefully this little comparison will help someone make their decision and give a better idea about some of the differences between the two phones. Starting this friday I’ll be losing my wonderful iPhone and immersing myself into the world of Android with the HTC Evo. The decision has less to do with dissatisfaction with the iPhone or the merits of Android, and more with moving from AT&T to Sprint. My fiancé had been on Verizon and I was on AT&T. Her contract was up and we decided to merge to a family plan of some sort to save money. While originally we were going to move her to AT&T, she didn’t like any of the phones and AT&T was a bit expensive (and a pain to set up). After some research, it became a simple math problem that Sprint won out by saving us $50 a month. The Android Logo is a little green robot man. Hopefully he will prove to be friendly. So I’m selling my iPhone (eBay link) and switching to the Evo in order to save some money. However, this does bring up an excellent opportunity as a developer. Mainly in starting to learn about Android development for making mobile applications. I find the Android development environment quite interesting. I’m not as big of an eclipse fan, preferring IntelliJ IDEA myself, but the Android integration with Eclipse is mighty slick. Having it bring up the simulator was probably as easy as it is for the iPhone. Interesting opportunities arise. While programming for the iPhone is all done in Objective-C, programs in Android are done in Java or other JVM compatible languages. The ability to use Scala or Groovy for making mobile applications. Granted the integration for Scala and Groovy might not be as good as straight up Java, but it’s still a benefit that it’s available. Also, since I’m a Java developer at my day job, jumping into Android programming should be a lot easier as I will just need to get used to mobile development and not a whole programming language at the same time. However there are parts of my iPhone I will miss. Since I play Go a lot, I’ve been very involved using a program called Boardz for turn based play. I’m not sure if there’s a good alternative app for the Android (I’m sure I’ll be looking on Friday). However, if there is not it actually provides me with an excellent opportunity. Basically to create my own version for the Android. You see, I’ve always been interested in doing personal projects, but I’m never able to come up with a good idea. Having an excellently delivered piece of mobile software that will be unavailable on my new platform gives me a perfect opportunity to recreate a similar program for myself and others. I’ve already started a bit by starting a project to convert parts of the Fuego Go library over to Java. Ideally when I have a basic library for dealing with SGF files and game moves along with calculating things like ko and final scores, I’ll be able to plug in a nice Android interface to it and build a server, maybe on App Engine, to handle game events. If anyone is interested in collaborating on a project like that, drop me a comment. I’ll have some actual code posted to my github project page later today. Aspirations of a Software Developer syndicates its weblog posts and Comments using a technology called RSS (Real Simple Syndication). You can use a service like Bloglines to get notified when there are new posts to this weblog.